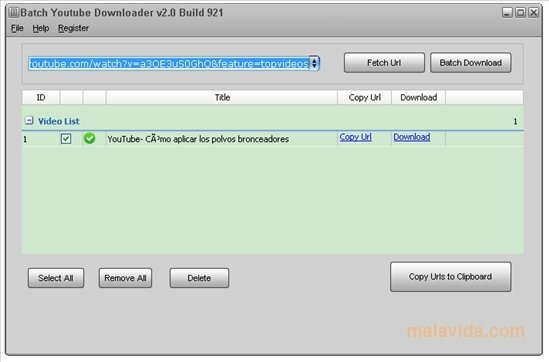 Cool YouTube Downloader is an application that will allow you to download videos from YouTube, Dailymotion, Vimeo and Metacafe, to name a few. Websites that are responsible for the vast majority of the current Internet traffic, due to all the possibilities they offer in what regards to consuming multimedia contents without having to download them to our computer. This program, also known as CYD, has been designed to help us out when we know that we aren't going to be able to enjoy our videos due to the fact that we won't have an Internet connection, or if we want to see them calmly while lying down on the couch in our living room. All we'll have to do is indicate the URL at which the file that we want to download can be found, and wait for the program to start downloading it to our hard drive. The download format is FLV and, as well as with the aforementioned websites, it's compatible with Tagged, Megavideo, Myspace and RedTube, to name a few of the more than 500 websites that it supports in total. Download Cool YouTube Downloader and discover a great application with which you can download files from your favorite video websites.